Explanation: Approaching over the north pole after nearly a five-year journey, Juno enjoys a perspective on Jupiter not often seen, even by spacecraft from Earth that usually swing by closer to Jupiter's equator. 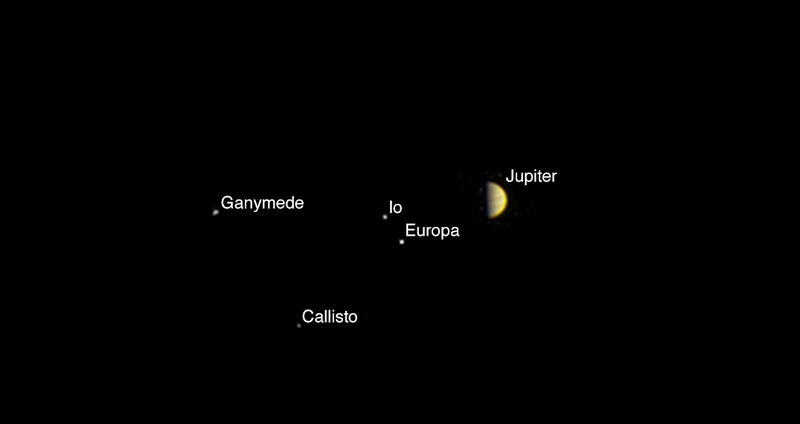 Looking down toward the ruling gas giant from a distance of 10.9 million kilometers, the spacecraft's JunoCam captured this image with Jupiter's nightside and orbiting entourage of four large Galilean moons on June 21. JunoCam is intended to provide close-up views of the gas giant's cloudy zoned and belted atmosphere and on July 4 (July 5 UT) Juno is set to burn its main engine to slow down and be captured into its own orbit. If all goes well, it will be the first spacecraft to orbit the poles of Jupiter, skimming to within 5,000 kilometers of the Jovian cloud tops during the 20 month mission.